Scores from the: That was a wild ride, bike tour. Wind and rain at the start of a ride: These things happen. Wind and rain that is horizontal: Its part of the adventure. Wind that appears to be lifting Jim off the road: Well its a real adventure. Streets that now are ponds: This is getting interesting. Streets where there are streams of water: There were always canals. The wind: We actually had the wind partially behind us for part of the day. We went North to the Lake Erie coast and the wind was out of the ESE. Once we turned up the coast we were battling a 20-30mph wind with serious rain. Please note that the wind did not blow from the west. Getting a standing Ovation from the staff when finishing. Thank you. Tomorrow: a much needed rest day. I got a ride to Perkins for breakfast this morning which served food as opposed to what I have been eating. I walked in the rain to the hotel. In a downpour Jim, Peter and myself followed our bike mechanic out of the hotel. Conditions were not great, rain, wind, fog. About 6 miles out our mechanic and his buddy abandon the ride. Just too miserable and they have done this before. Tom from CT joins us and we ride into the first SAG. We refuel, George who left early joins me and Jim. Peter SAGs to the hotel, Tom stays at the SAG and eventually SAGs to the hotel. Jim, George and I make it to the second SAG which is at a Drive-in. We have now hit Lake Erie and turn into the heart of the wind. Jim and I battle into a raging storm, eventually making it into the hotel and being greeted by a standing ovation by the staff. The storm reminded me of this past UofM vs Nortwestern game where Ed and Andy Hood, Mel M. and myself stayed to the bitter end. It is an adventure. Jim took this picture with his waterproof camera. This is just before the storm intensified. Walt and Sandy, does this look familiar? 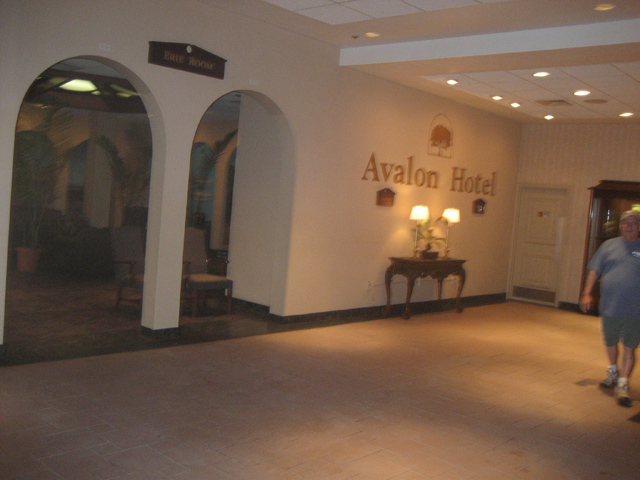 Ah Yes, the good old Avalon - Stayed there lots of times. I'm heading to Harrisburg and Spring Hill, MD next Tuesday - Thursday to do installation work. It's a shame I'll be missing your route by just a few days. Since you're so fit and used to the rides - Why not double back and see me? Just so I'm clear - If you choose to, I will NOT be blowing you Kisses! We're still watching the postings and wishing you well - Getting near the finish - Stay safe! 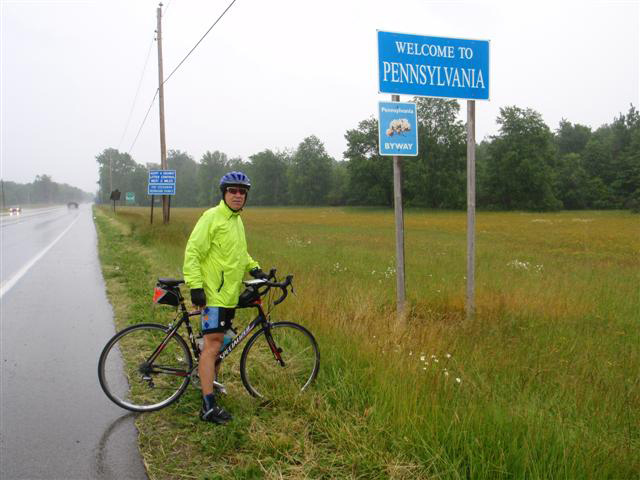 OK Al, this is the part of the ride that we did 2 weeks ago (by car). Be sure to note the surroundings, wine growing area, overlooks, and all the historical stuff. There will be a quiz in 1 week. It's fun to tell Al stories back in AA. P.S. roddy its alittle late to play hard to get! In case you haven't been watching the weather station-- the east is been getting 3and4 times the normal amount of rain this spring! Also you have a competing group going across country--in model't's I wonder who is faster? Al, I have a biking rule that has served me well over the years. Never START a ride in the rain. If it rains on you while you're riding, well, these things happen. But never START riding when it's raining. That's why there are SAGs. Roddy and Larry's story gave me best best laugh of the week!